Meanwhile, to flatten each pork chop, place between 2 pieces of plastic wrap or waxed paper. Working from center, gently pound pork with flat side of meat mallet or rolling pin until about 1/4 inch thick; remove wrap. Sprinkle both sides of each pork chop with seasoned salt, garlic-pepper blend and thyme. When grill is heated, place pork chops on bottom grill surface. Close grill; cook 6 to 8 minutes or until golden brown and no longer pink in center. Spread bottom halves of buns with barbecue sauce. 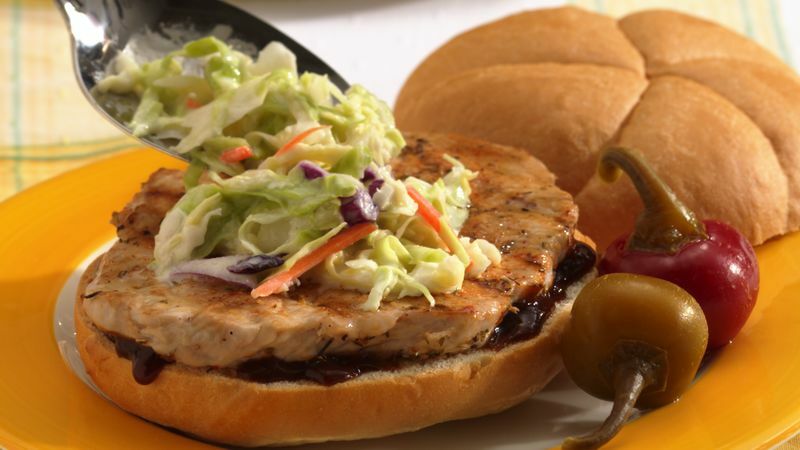 Top with pork chops, coleslaw and top halves of buns.